My children and I will be working our way through Food Renegade’s “Real Food Nutrition and Health” book during the fall and winter months as part of our homeschooling curriculum. We’ve hit on nutrition in other homeschooling curriculum options and let me tell you, it has always been disappointing. Until now. Finally! A Nutrition Text That Gets It Right. Kristen Michaelis is Food Renegade, and her nutrition text is engaging and informative. She wrote the text for high schoolers, but she’s coming out soon with a text for younger elementary aged kids. My girls, who are 11 and 13, will do great with the high school text. It is probably too old for my son C. (9), but that's all we have right now. After looking through Kristen’s book the last few months, I feel confident that it will give my children a solid grasp of real food nutrition. I’m excited for what we all will learn! I will appreciate being able to sharpen and refine my understanding of nutrition, too. I’m totally on board with that. Would you like to join us in our study? The book spans 11 chapters and we will keep an easy pace of working through one lesson (chapter) per week. Kristen takes a classical approach to homeschooling, which I love, and the chapters offer engaging reading materials, for independent study or reading aloud. Her current text is for older children, ages 12 and up. She’s planning a text for elementary aged students, as well as a coloring/activity book for the much younger. They will be ready hopefully soon, but in the meantime, onward and upward! You can get a FREE sample chapter by clicking right here. I’ll be taking a stab at writing discussion questions and follow-up activities for the chapters (though Kristen is working on that, too!). I invite you to work your way through the book and discussions with us. I will make a weekly blog post about each chapter, sharing our impressions and what we learned, and asking you to share your family’s thoughts. Even if you're not homeschooling your children, we'd love for you and your kids to join us. Wouldn't it be great for you to counter-act the false information in the school systems with nutrition information that respects God's design? We won’t start for some weeks yet, as my family still has summer projects and vacations happening. I anticipate starting toward the end of August, with the following tentative schedule. Or, you can download the schedule as a PDF. Grab a sample chapter here to check out Kristen's engaging, passionate style. Want to Join Us? Please Do! Comment below to say you’re in! Come back here the week of August 16 to grab the discussion notes for Lesson 1. Come back the week of August 23 to share your impressions of lesson 1, and grab the discussion notes for Lesson 2. Invite others to join us, too! *The immediate download PDF eBook is $19.95; the 203 page, spiral-bound printed book is $29.95. GNOWFGLINS will earn a commission on each sale, but honestly, we'd be doing this study whether or not we were associated. Thank you for supporting GNOWFGLINS with your purchase. You should also know I'm very thankful to be undertaking this study with Kristen's permission. That sounds wonderful. I’ve been looking for just that kind of curriculum. Unfortunately I need to wait for the next book. My kids are 9 and 6. thanks for the heads up! Ok, I’m in! I am waiting (not so patiently!) for the younger kids version though. Looking forward to it. We have it already, and are planning to start it this fall too!! So we will join you, for sure. We have spent the summer reading Omnivore’s Dilemma for Kids after watching Food Inc last spring (watched it several times, actually). Its a great book, and all the kids (ages 5 to 17) are enjoying it. I think they are learning a lot already, and I look forward to more in-depth studies for the olders. I look forward to the nutrition book for the younger children. The younger children are also studying thru Human Anatomy and Physiology by Jeannie Fulbright, and I intend to emphasize nutritional concepts throughout that study as well. Getting it from every angle!! Looks like a great resource! I, too, will be excited to see the version for younger children. Wardee – I am excited about the version for the younger kids. Will is going into the fourth grade this year and I think it will be perfect for him. I have never homeschooled any of my kids, but this year I am pulling Will out of school and we are doing an online virtual charter school designed for kids with special needs. I’m really excited about it, but also quite nervous. Like I said – never done this before. BUT, I know this will give us a chance to really focus and excel at the things that really interest him. One of those things is food and cooking (he must take after me.) 😉 So I am going to get this book and go through it with him. Wardee, did you buy the spiral bound book or the pdf? I’m not sure which one I should buy. I prefer having a book in hand, but the pdf is cheaper. Do you know if the pdf is actually downloaded or if one must put in a password to each time to access the book online. I have purchased patterns that require a passworkd each time you access it, so it is not really downloaded…I think it is still on the pattern website. I hope this makes sense. Corinne – I bought the PDF. It downloads all the way to your computer for the future. You don’t have to worry about not being able to access it. It has wide margins to fit well in a binder when hole-punched. Also, our printer does double-sided printing, so it took just over 100 pages for me to print it. I compiled an index for a major publisher’s new science textbook and I was SO disappointed. Here’s a brand new text, aimed at elementary kids, from a first-rate and reputable publisher, a leader in the homeschool science curriculum community and the author is pushing the food pyramid and low-fat agenda. On the other hand, hubby has just completed writing his second textbook (for the same company but not a science text) and managed to work in some very strong wording about proper nutrition, rest, exercise and sunshine. I’m so proud of him! We used “Nourishing Traditions” and some of the sources it cited as a high school level nutrition text last year. It worked well but was a lot of work for me to compile lessons. I plan on doing Food Renegade’s textbook in 2011/12 with my younger kids. I can’t wait! I’m so glad this info is finally getting out there. Great resource! I’ll be using it this fall & winter too! I’m excited you’re all going to participate, now or in the future! My older girls and I are in. What a great resource! My sister in law is homeschooling my little niece and I know she will be interested in the younger version. This concept of Real Food is similar to what Dr. Josh Axe teaches (www.DrAxe.com). He also has a cookbook coming out later this fall called The Real Food Diet cookbook. I can’t wait! Wardee, as you have looked through the book (I don’t have it yet) do you think the chapters can be done one per week? I’m thinking of getting together with my daughter (8th grade) and one of her friends once per week and going over a chapter. I don’t want to give them ‘homework’ since I don’t want this to be a burden added to their load. I just want it to be a fun thing we do. I was thinking of reading a chapter together each week and going over questions and stuff. I also thought it would be fun to add a hands on element to it for each chapter. Like making a simple recipe or trying some foods that go with the theme of each chapter. What do you think? I just downloaded the E -Book! This looks like it will be a great class. Count us in! I am looking forward to learning alongside my kids! We would love to join you. I’m really excited about this, and that you all are interested! Let’s hope the younger book comes out soon. In the meantime, this Thursday (August 19) Friday (August 20) I’ll put up the discussion questions/activities for chapter 1. Next Thursday (August 26) Friday (August 27), I’ll put up a blog post for us all to discuss chapter 1 and what our children learned. I’ll also put up the discussion questions/activities for chapter 2. And so on… Make sense? See you on Thursday Friday! We’re in! and we can’t wait to get started! 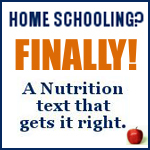 I’ve been homeschooling for years and have never seen a nutrition text like this one. My 20 yr old daughter will be joining my 9th grader and me for the “class”. I am SO excited for this! We’re big on natural health and have our own organic co-op. I considered creating my own homeschool curriculum because of the lack of good nutrition curriculum in this area. I’m glad there is something out there we can trust. Saves me time to create my own. LOL. I am new to GNOWFGLINS (just found your site over the weekend) and am loving your website! What a blessing! Jocelyn, Hello! You don’t have to stick with our schedule, no. Though it might be more fun! 🙂 Feel free to grab the downloads and save them for when you’re ready. The posts will always be open for you to come and add your thoughts when the time is right. We would love to join you! I’m downloading the eBook now. Thanks so much for doing this, you really amaze me, all that you do!!! We are looking forward to joining in too! Great resource. How do we access the notes for the class? We can’t wait to start. Debbie – There will be a download in each post, which will cover the following week’s discussion questions/activities. Beginning tomorrow this Friday! Oops! I messed up my days. I’m putting up the posts in this study on Fridays, starting with the day after tomorrow. So sorry, everyone! I spaced out that Thursday are already filled with Simple Lives Thursday, so I can’t do the study that day as well. I am a little tardy but I am here with my downloaded book. Can’t wait to learn, learn, learn. I’m in. I am not homeschooling per say but I have two grandchildren at home ages 16 and 4. I believe I can use this to learn more for myself and in return help them. Awesome! The discussion questions are perfect! My 9th grader starts this tomorrow and I’m printing them right now to slip in that binder. I think this is going to fill in perfectly with the ebook text, as wonderfully fabulous as it already is. You are gifting us with so much, Wardee. Thank you. Hi, I am a nurse and practiced for 27 years…now I have been homeschooling my teens for 4 years. I love real food!! Was wondering your thoughts on “alkaline” diet. I personally think this is another fallacy as your lungs and kidneys take total control of your blood ph, not your food intake. I have not read your book yet but am very interested to read it. I have the 2 free chapters I am reading through now. Thank you so much for caring!! Wow, this looks amazing!! I can’t wait to use this resource.